The Google Cloud Firestore is a flexible, scalable database for mobile, web, and server development from Firebase and Google Cloud Platform. Like Firebase, it keeps data in sync across client apps through relatime listeners, and offers offline support for mobile and web, so developers can build responsive apps that work regardless of network latency or Internet connectivity. Given the differences between the 2 approaches, data modeling for the RealTime Firebase requires a separate plugin. 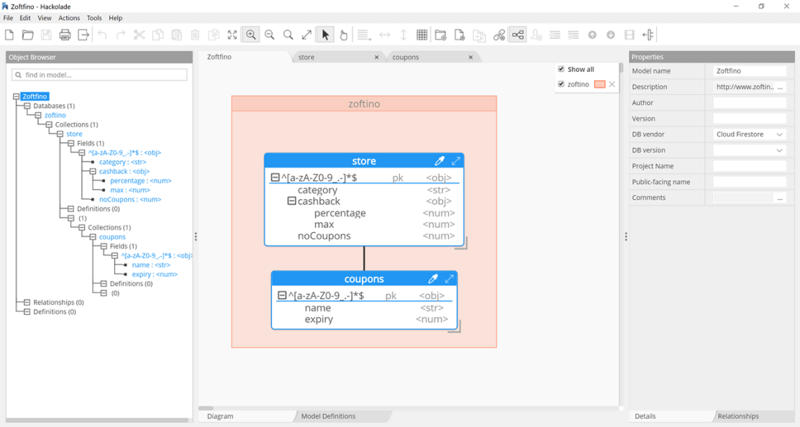 To perform data modeling for Firestore with Hackolade, you must first download the Firestore plugin. Note: the reverse-engineering of documents is not currently available. It is being developed and will be released at a later time. In Firestore, data is stored in documents, which are organized into collections. Each document contains a set of key-value pairs. Cloud Firestore is optimized for storing large collections of small documents. All documents must be stored in collections. Documents can contain subcollections and nested objects, both of which can include primitive fields like strings or complex objects like lists. Collections and documents are created implicitly in Cloud Firestore. Simply assign data to a document within a collection. If either the collection or document does not exist, Cloud Firestore creates it. Not applicable, as Firestore does not provide any way to enforce any kind of schema.